Recently I had the exciting opportunity to shoot an episode of “Terrorism: Close Calls,” a Netflix Original series premiering in October 2018. The veteran writer-producer Maria Berry was the creative force behind the entire series, and it was great to team up with her again after collaborating on similar shows that we shot in The West Bank, Grenada and points around the globe for History Channel. 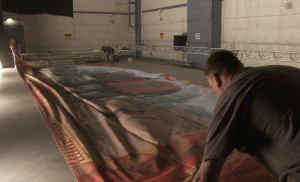 JC Backings, the owner and curator of thousands of scenic backdrops dating back to the 1930′s, when the scenic paint building was first constructed at MGM, is moving out of their home on the Sony lot. The building where all of the backdrops were painted is being re-purposed. 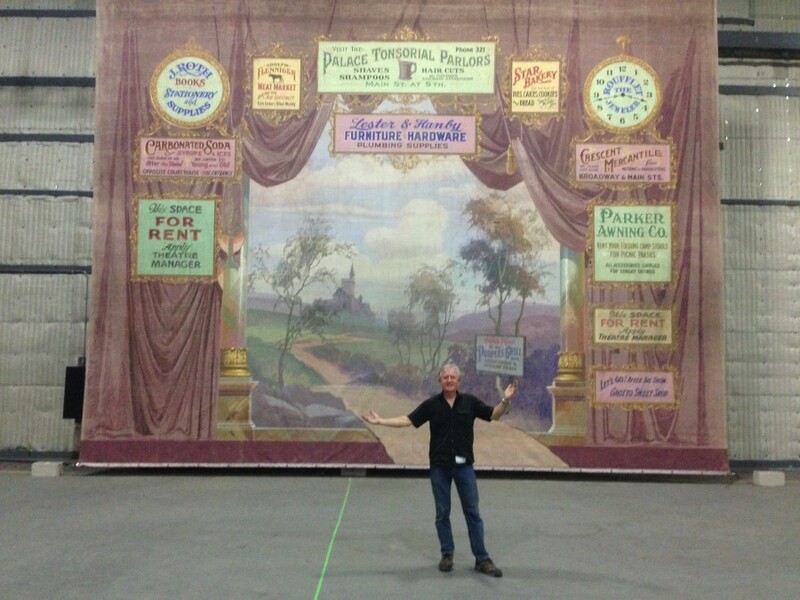 The sentimental, artistic and historic value of many backdrops, painted for iconic film classics, can’t be denied. 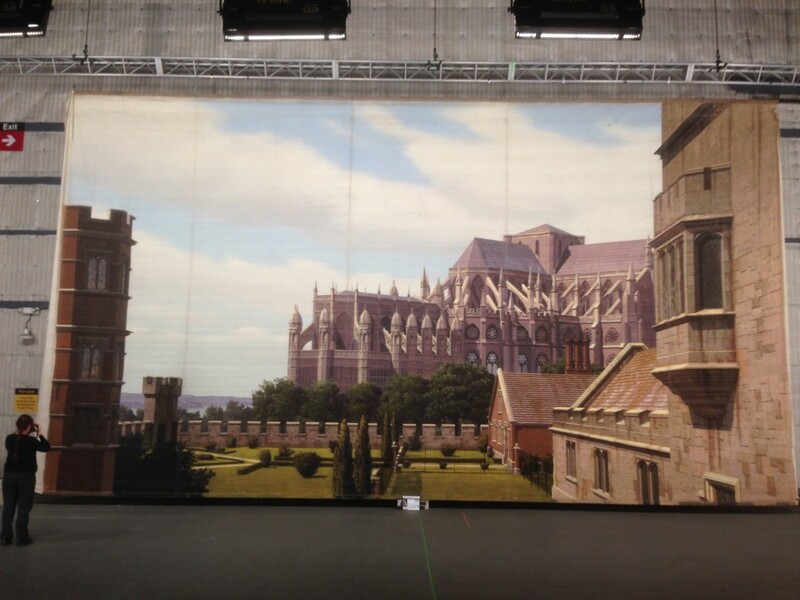 But – thanks to the advance of technology – backdrops are created digitally now, not hand painted as they were for decades, by highly skilled artists who could draw and paint their scenes to look like photo-real shots for the camera. 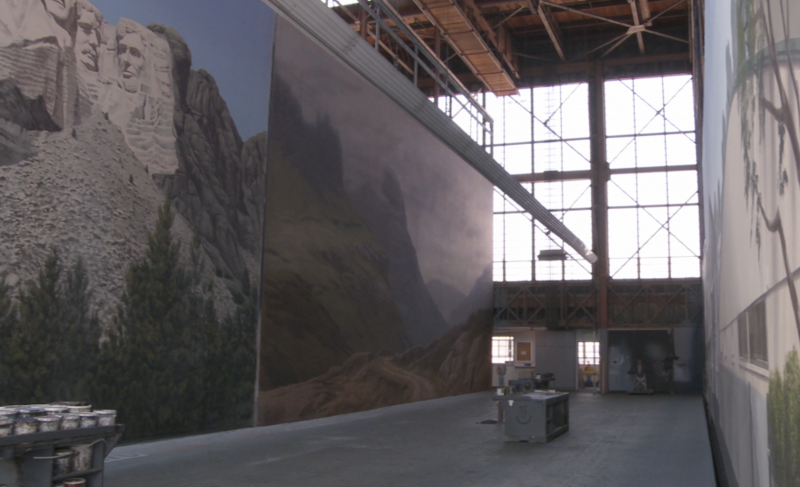 (The story of these artists is published in the ultimate book on the subject “The Art Of the Hollywood Backdrop”) So many of these backdrops don’t have any commercial use. They are old and worn, and the company couldn’t afford to keep them. 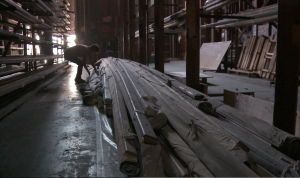 Hundreds of backdrops were pulled from warehouse racks where they had been stored for decades. To keep them from going into the trash, one of the authors of the book, Karen Maness, teamed with JC Backings and Tom Walsh, President of the Art Directors Guild to create the “Backdrop Recovery Project” to identify, catalog and photograph these artifacts of film history. 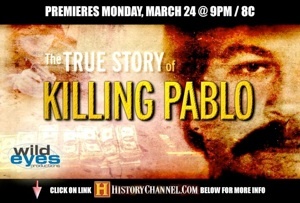 I was lucky enough to be part of this effort by documenting/shooting the labor intensive process performed by volunteer art directors and production designers. The logistics of the process were inspiring to watch. 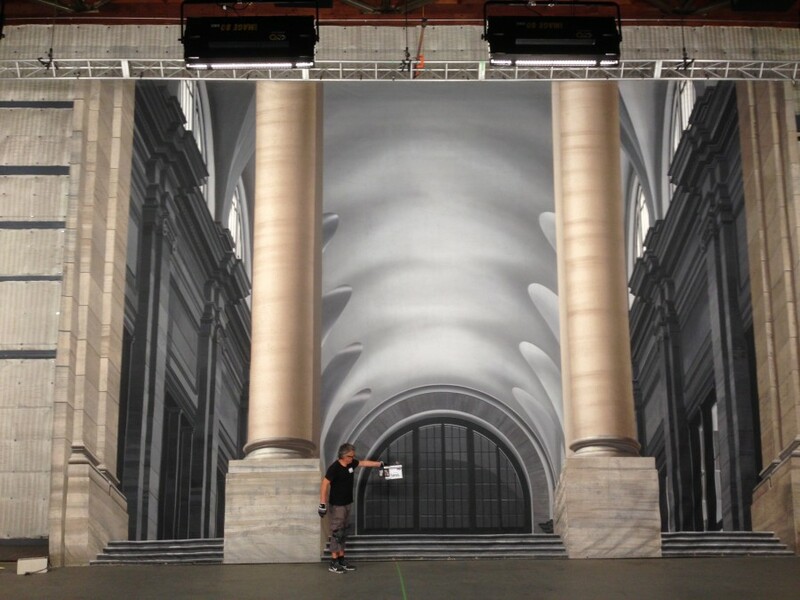 The 207 backdrops ranged in size from 6′x 10′ up to 30′x 100′. 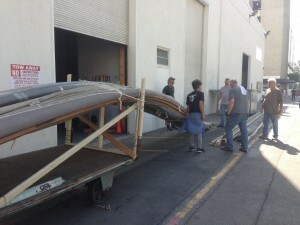 Most were fastened to wood battens that were up to 40 feet long that took three men to carry. Some paintings weighed hundreds of pounds and in total there were TONS of art. Hauling piles of these drops through the Sony lot to Stage 23 elicited amazed stares from studio veterans, and looks of wonder and interest from young artists curious about them. Some of the backings were identified only by number in an old catalog. As they were unrolled, hung and photographed, Tom and Karen researched film archives and were able to identify them on the spot –with amazing results! Half of the backing of the U.N. lobby from North By Northwest, being photographed by Melinda Sue Gordon. 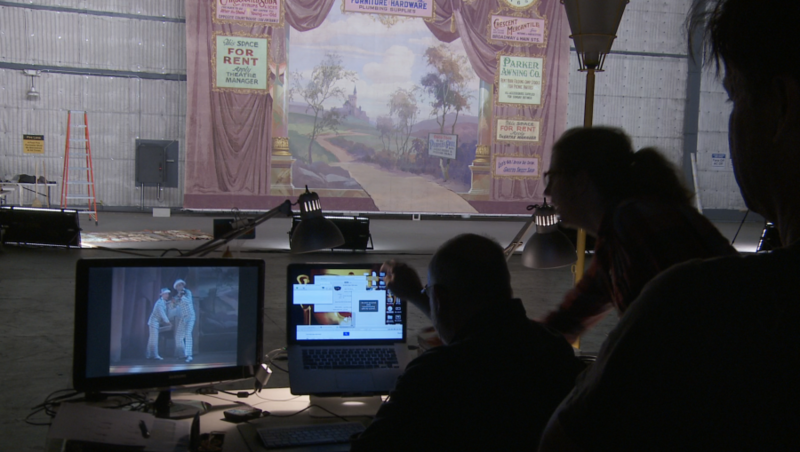 Tom Walsh and Karen Maness comparing the “Fit As A Fiddle” scene in “Singin In the Rain” to the original backdrop that was discovered. 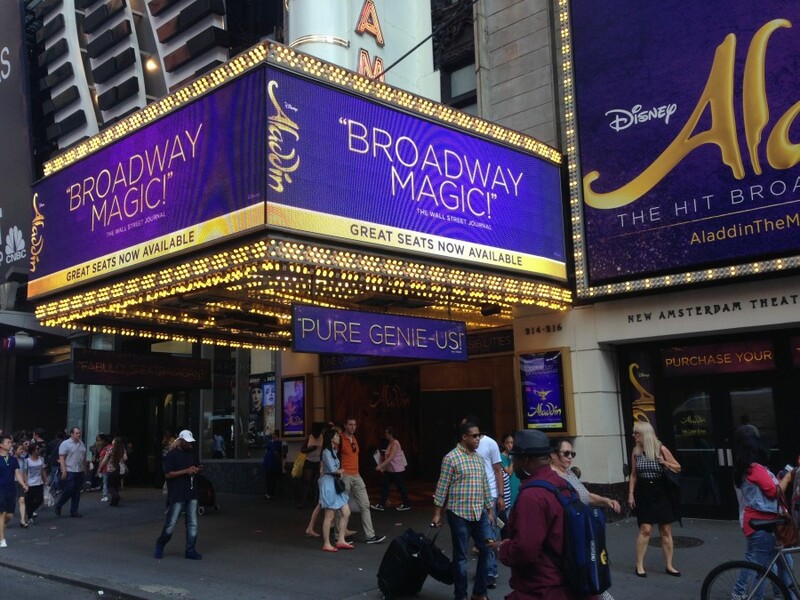 Me – following in Gene Kelly and Donald O’Connor’s footsteps. Nine days of hard work brought the project to a successful completion. 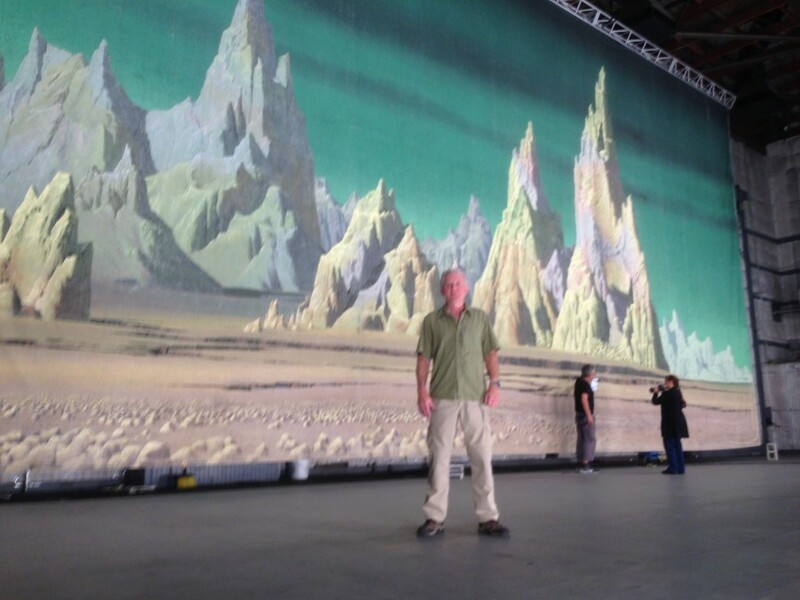 During it I had to put down the camera sometimes to help hang 60-foot canvases. 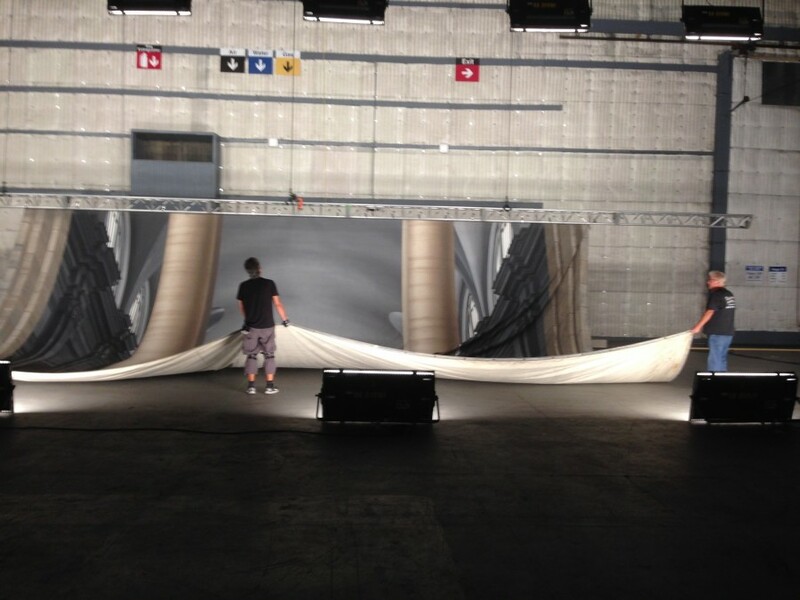 I also found out how to correctly fold huge sheets like that. If you think its a challenge to fold 60 foot long sheets, you should try folding a 100-footer in to a neat bundle. All the HD footage will sometime soon be fashioned into a documentary that tells the story of the creation of these magnificent works of film art by many of the artists, the films that they were created for, and what ultimately will happen to them. All 207 backings were photographed in great detail by Melinda Sue Gordon for the Art Directors Guild, the Motion Picture Academy Archive…and for posterity. 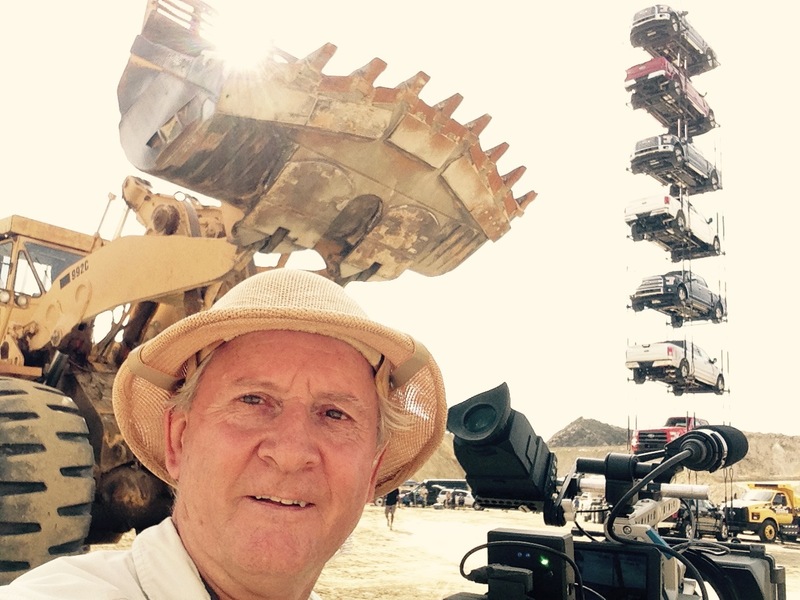 In the life of a freelance cameraman there is no telling what the next job will entail. You never know what you will run into, and for that reason I have found that a vital quality for success is the ability to anticipate – and imagine – what challenges you might encounter. Two recent shoots were about as different from each other as they could possibly be. 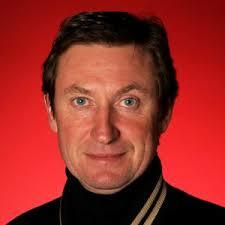 Each required completely opposite skills and camerawork. The answers to the usual pre-pro questions were wildly diverse: What kind of camera(s)? Three different kinds on one shoot. Three other models on the next shoot. What style shooting? Locked-down on sticks in a small hotel room for one. 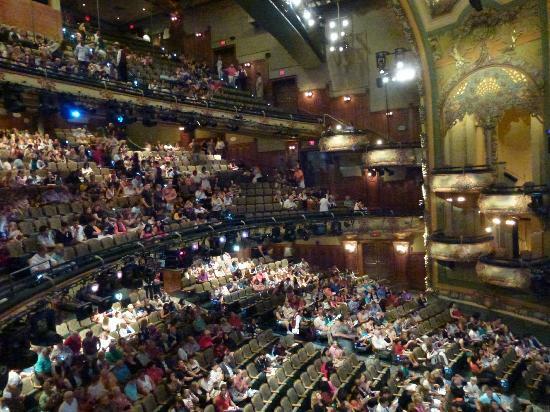 Roaming seven floors of a theatre on Broadway for the next. Wow! There’s a lot that could happen in these environments. Each gig took place at an iconic location – the first one on the West coast, the second one on the East coast. 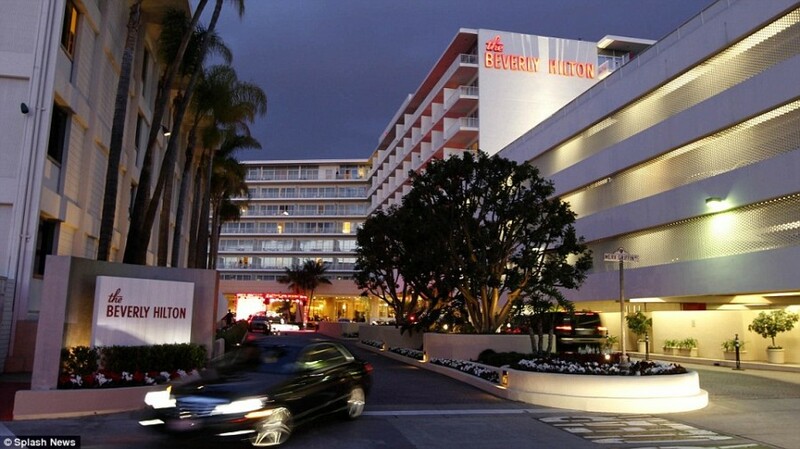 First up, a day of interviews with the on-screen personalities of the Nat Geo shows at the Beverly Hilton hotel. 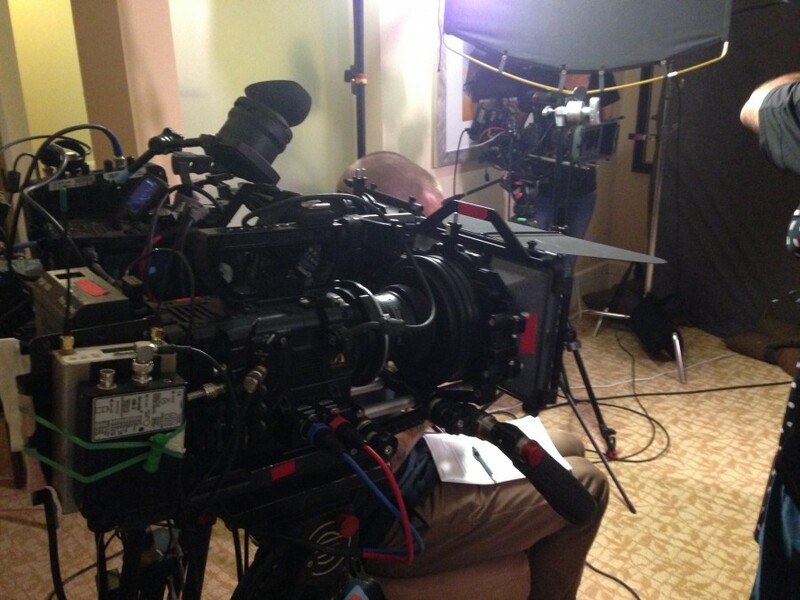 Our Sony F5 and FS700 side by side shooting different frame sizes and the Canon 5D in the background shooting profile. You can barely make out our interviewer seated beside the camera. Finding enough space for lights at the right positions to work for two camera angles, and enough space for the three operators as well as the sound man and four Nat Geo producers and marketing reps was not even the biggest challenge! 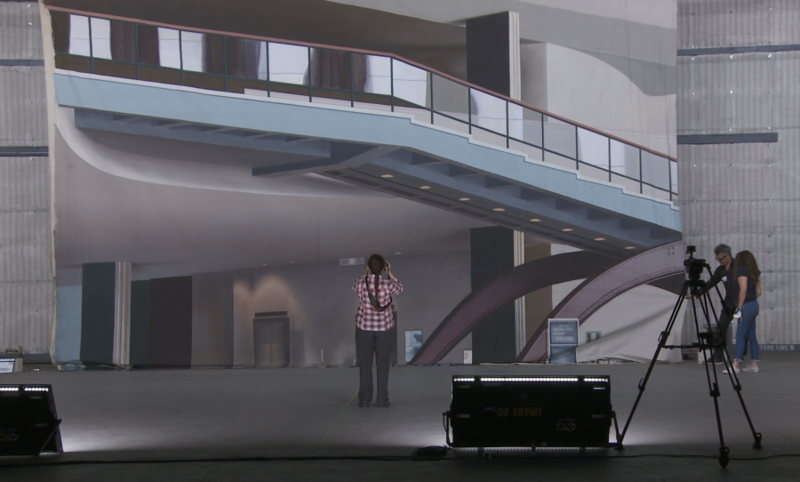 It was hanging a backdrop and wrapping it around two walls to cover both camera angles – and getting all the wrinkles out! 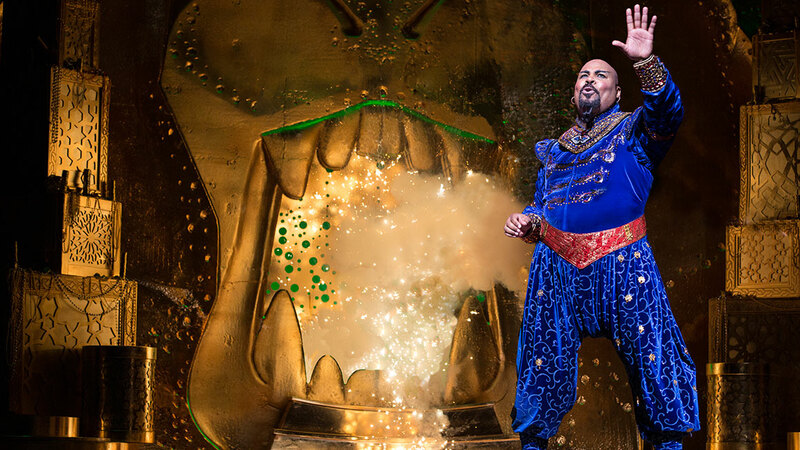 The next job afforded me the rare opportunity to shoot behind-the-scenes at the Broadway production of “Aladdin” in the historic New Amsterdam theatre. This impressive location, built in 1903, was the home to much of Broadway history, including the Ziegfeld Follies, and encompasses seven floors of backstage spaces, passageways, changing rooms and stairways. 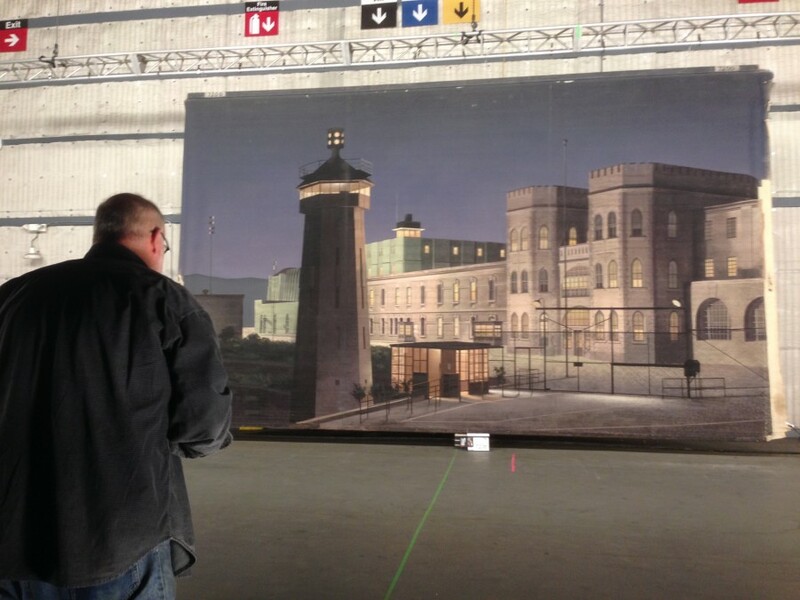 During the urgent activity of a live production this building sizzles with the activity of hundreds of cast and crew – all moving to precise spots on an exact timetable. To capture this with a camera meant being as mobile as they. 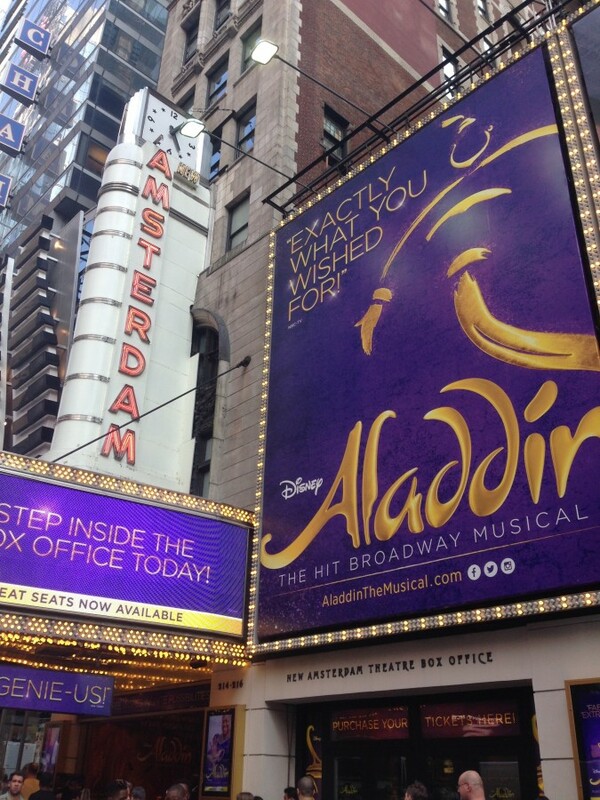 It would be a real race to follow the actor who plays the Genie, Major Attaway, backstage from dressing room to stage wings, up and down seven floors, throughout a live performance. Handheld was the only answer, so I used a monopod with a Sony XDCAM EX1 and rode the exposure and gain. Additional coverage of the costumers and dressers interacting with the cast was done during a rehearsal with the aid of 5 Go-Pros and two Sony FS700′s. The project will be a special edition segment of ESPN’s “Sport Science” show that will reveal some of the unknown science behind the athleticism involved in performing prolonged singing and dancing routines. One of my favorite gigs is shooting the regular episodes of “Sport Science,” the innovative blend of science and sports now in its tenth season that airs on ESPN. The creative topics continually fascinate audiences. 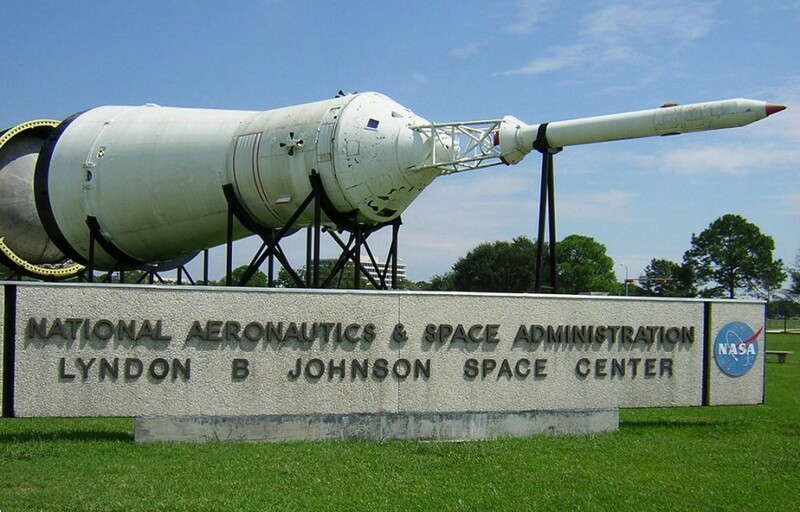 This latest outing had our crew travel to the NASA Johnson Space Center in Houston to find out what it might be like to play football on the moon! At 6am on May 18, 2016 dawn was breaking and it was just light enough to see a huge silhouette looming over the flat ocean horizon. 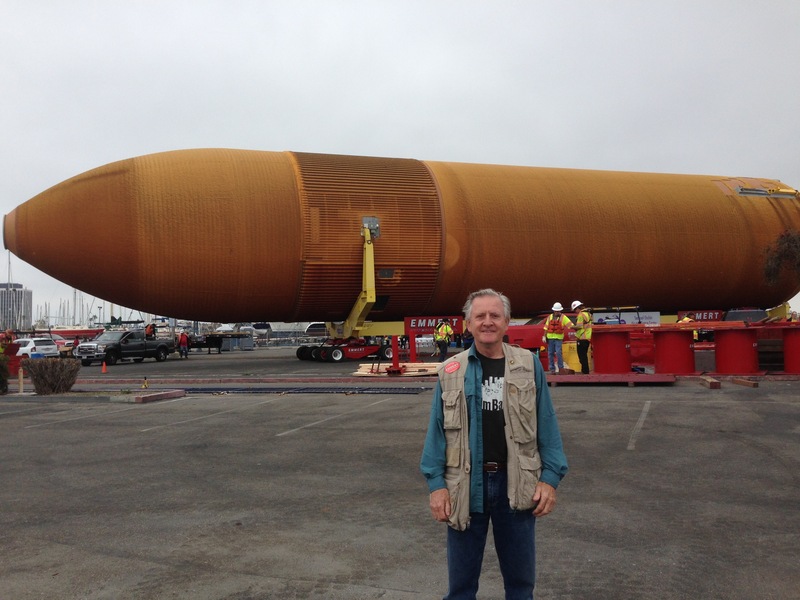 Right on schedule the last Space Shuttle fuel tank in existence, known as ET-94, chugged into Marina Del Rey behind a massive ocean-going tugboat. It was tired from its 4000 mile journey from New Orleans through the Panama Canal. 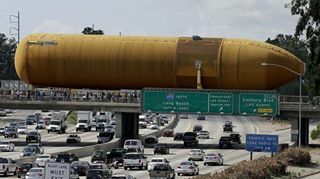 Once it touched land, it only had 16 more miles to go to reach its final destination – the California Science Center in Exposition Park in downtown L.A. 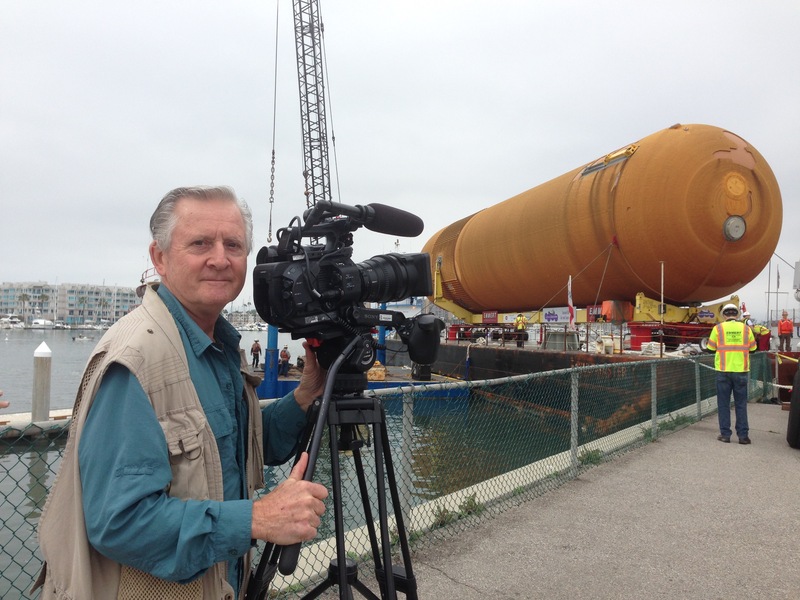 I was part of the official film crew to document the tricky logistics of getting the 66,000 pound monster off the barge and on to land without mishap. The process involved dozens of experts, a semi-truck of heavy equipment and an all-powerful tow truck; and it was painstakingly slow and methodical. That day time-lapse was our friend! Camera equipment to record this historic event was donated by Sony and by my friends at Stray Angel Productions. You know, when I look back at this event the marina setting was perfect. The whole massive operation was a lot like a fisherman landing a big game fish. And as the camera operator I felt like a fisherman on WICKED TUNA who has to act fast and hard to bring in his fish. ”How can that be compared to this slow moving fish” you ask? My challenge was to work at the other extreme. I had to anticipate the movement and the speed of the tank to frame time-lapse shots and speed up the action that was so slow you could hardly see it happening. This meant choosing the right frame rate, the right frame width and height so the tank wouldn’t leave frame. A fisherman has to use split-second reactions in time with his fish. I had to anticipate what my fish was going to do an hour beforehand. I had to frame up my fish an hour before it reached its spot! 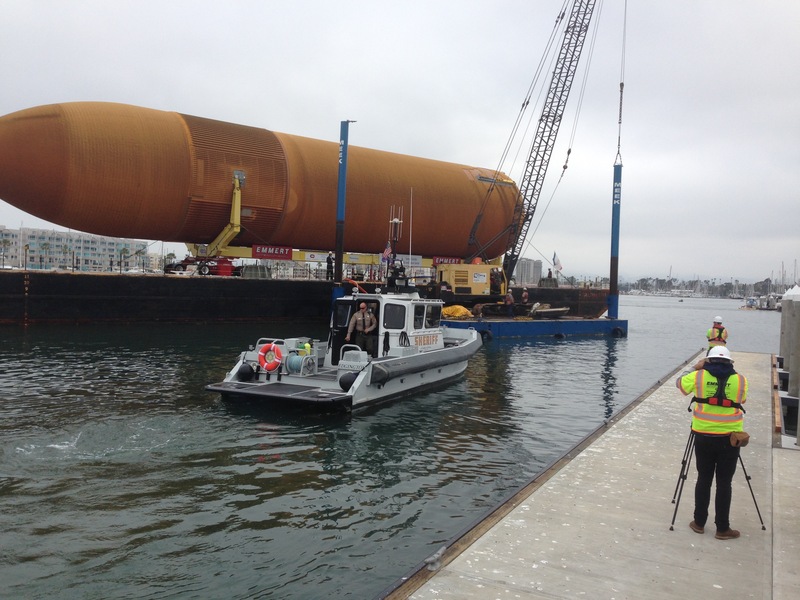 When it finally came to rest, Mayor Garcetti and several councilmen welcomed ET-94 to its new home in LA in front of the massed press corps, and everyone was happy. 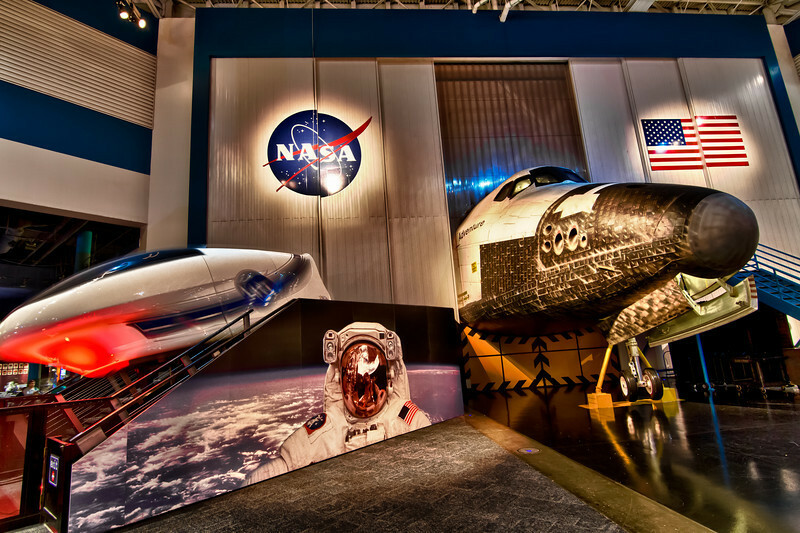 Now there is a permanent record of its journey that will be part of the exhibit at the California Science Center for the future. It’s not often the I am called upon to operate camera for a two day multiple-cam shoot. Usually I go solo. But a recent gig involved not only three cameras, but two teleprompters, two hosts and two on-camera guests. 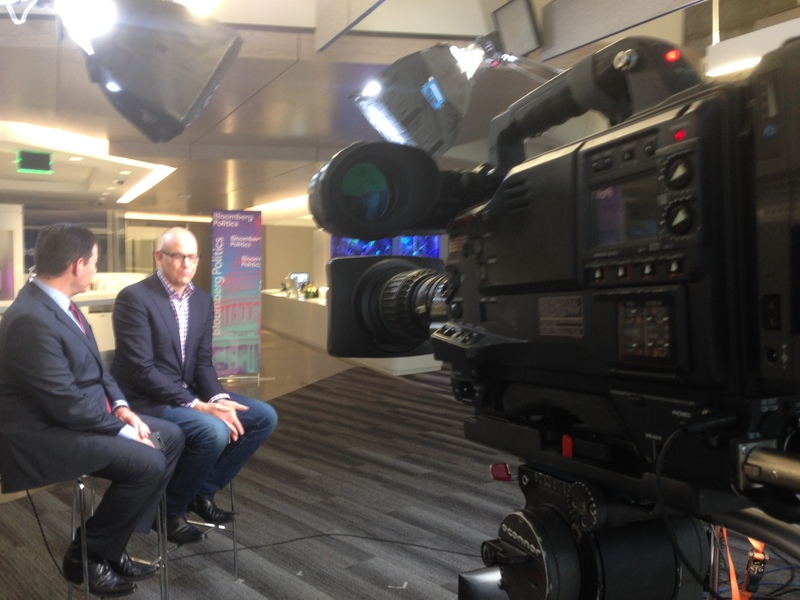 Not only that, it was for a live broadcast on Bloomberg TV. 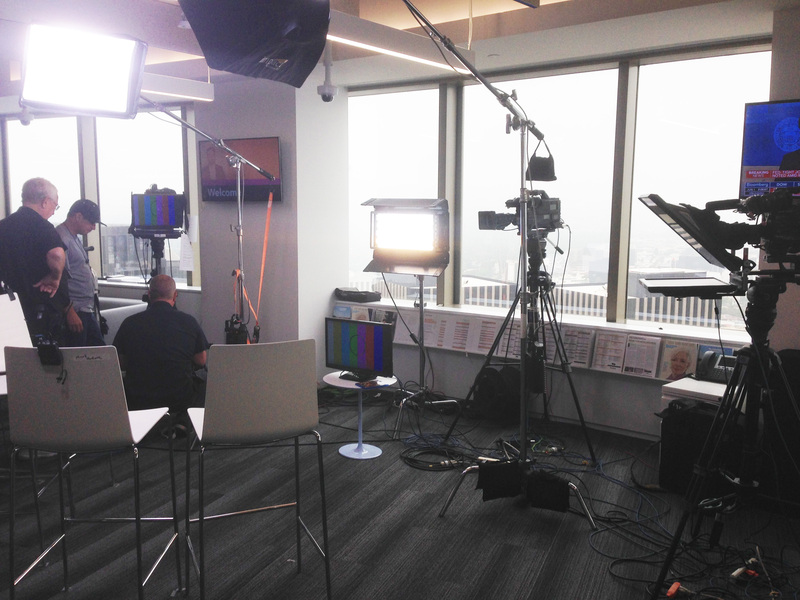 An on-site satellite broadcast studio was put together in the 33rd floor offices of the Bloomberg L.A. Bureau in Century City. When its a live national broadcast everything has to work just right, and that includes the headset communications between the crew and the producer in L.A. and the director in New York, the IFB channels between the director and the talent sitting in front of cameras, the audio from 4 mics and the video signals coming from three cameras and going to the satellite truck and beamed to New York. Let’s not forget the teleprompter script coming from New York and being fed into the monitors, and the camera feeds being shown on the on-set monitor. But how do you get all these communication channels connected to the outside world? The whole pipeline depended on an audio-video fiber optic cable drop that ran down 33 floors of a stairwell to the street where the satellite truck was parked. News anchors John Heileman and Mark Halperin get ready to go live. The audio connections alone would boggle the mind with their complexity. 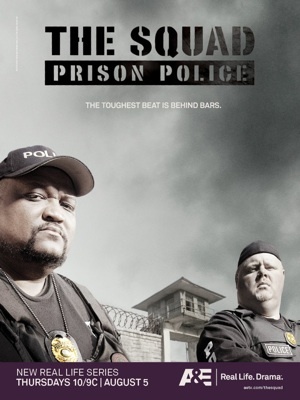 Only someone like ace soundman Johnny Camilo and camera crew chief Todd Parks of Southern Image Prods. could pull off something like this without a hitch. The whole system worked. The network of tech was stable. There were no solar flares or meteorites to take out the satellite. 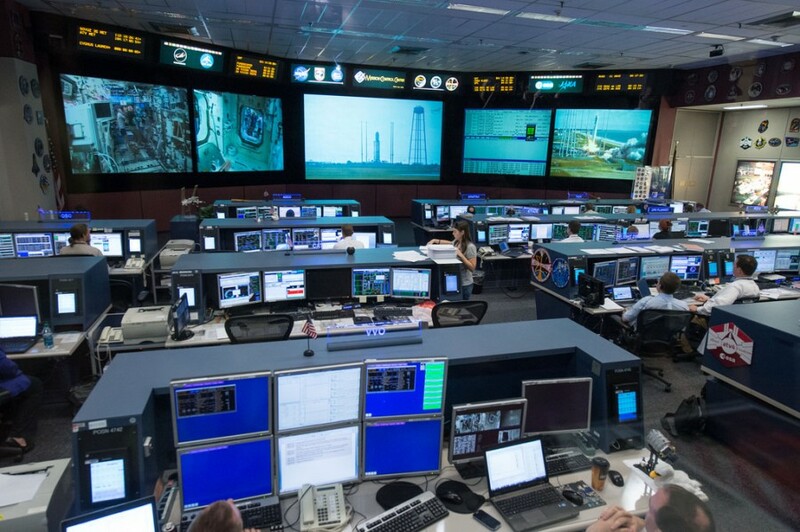 And there was no room for operator error or lapse of concentration for even a second. It was a welcome reminder that those white-knuckle high-pressure shoots keep you at the top of your game. A recent day of ESPN “Sports Science” shooting took me to Manhattan beach. 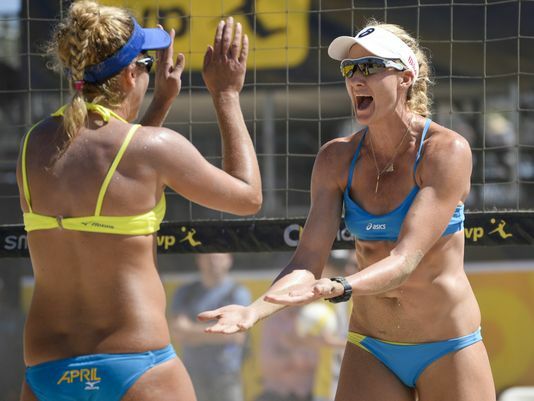 There we had to keep up with the frenetic activity of world class beach volleyball as Team USA veterans Kerri Walsh and April Ross were put to the Sports Science test. These photos, taken at other matches, give a vague idea of the athletic ballet we captured that day. Its pretty much the trademark of Sports Science, and for a shooter its great fun. 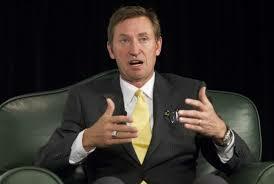 A recent shoot day for Monumental Sports & Entertainment involved a brief in-and-out with The Great One, Wayne Gretzky. He recorded a personal congratulations to one of his favorite hockey players, Alex Ovechkin, on Alex’s milestone 500th NHL goal. At the very top, traffic on the busy California freeway. Below the cliffs are a convoy of landing crafts filled with Marines. 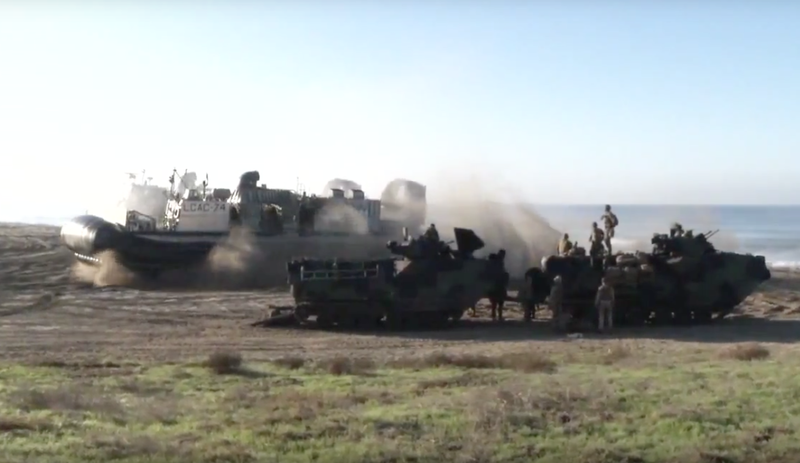 At the bottom, armored vehicles unloaded from giant hovercrafts. 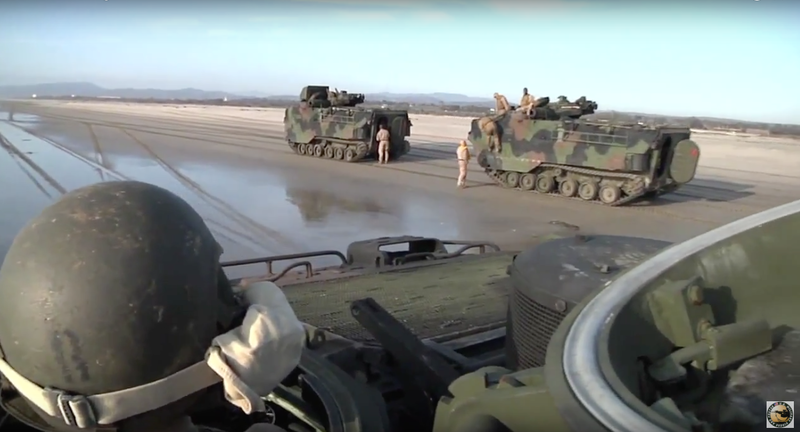 I recently had the privilege of roaming the beaches and cliffs of the Marine Base at Camp Pendleton and composing shots of some of our nations proudest and bravest –the 9000 marines that made up the forces of the massive training operation “Steel Knight.” The huge event involved a warship offshore, two LCAC’s which are 100′ long hovercraft that carry tanks and trucks through the surf to shore, and a dozen landing craft that I will call floating tanks. They also are designed to power through the surf. 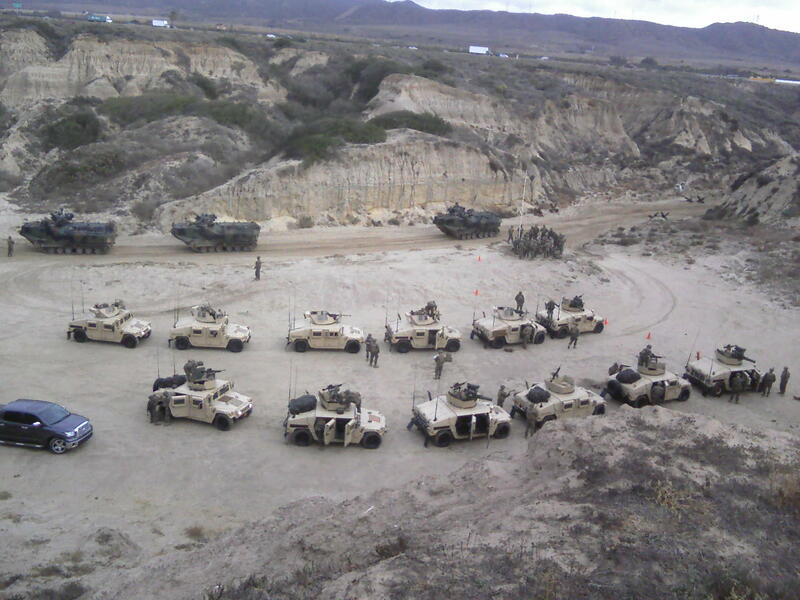 This was all part of the amphibious landing training that Marines engage in. I want to tell you, its an impressive sight to see through a 250mm lens in high definition. And I am happy to report that even with miles of beach-walking and scrub-brush wading (you go where the Marines go) not a speck of dust, sand or sea water on the lens – Yay! 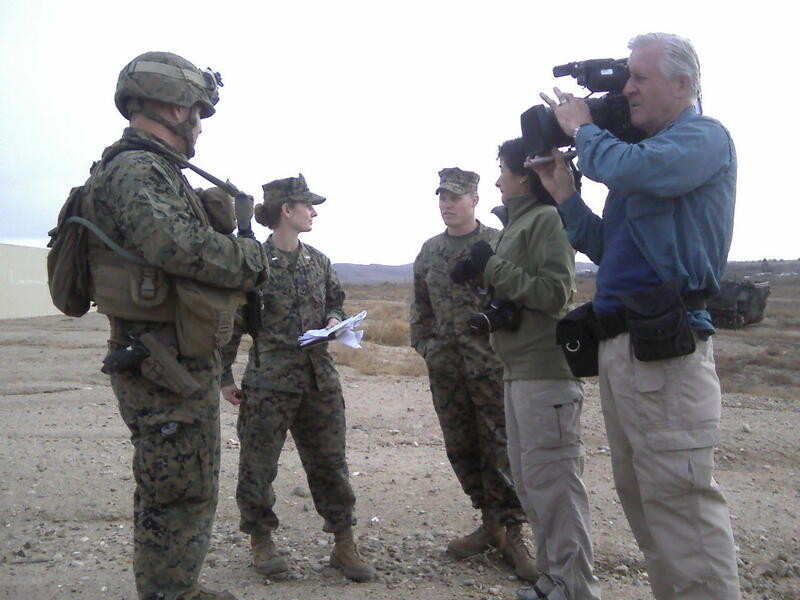 Doing an on-the-fly interview with a Marine policeman. 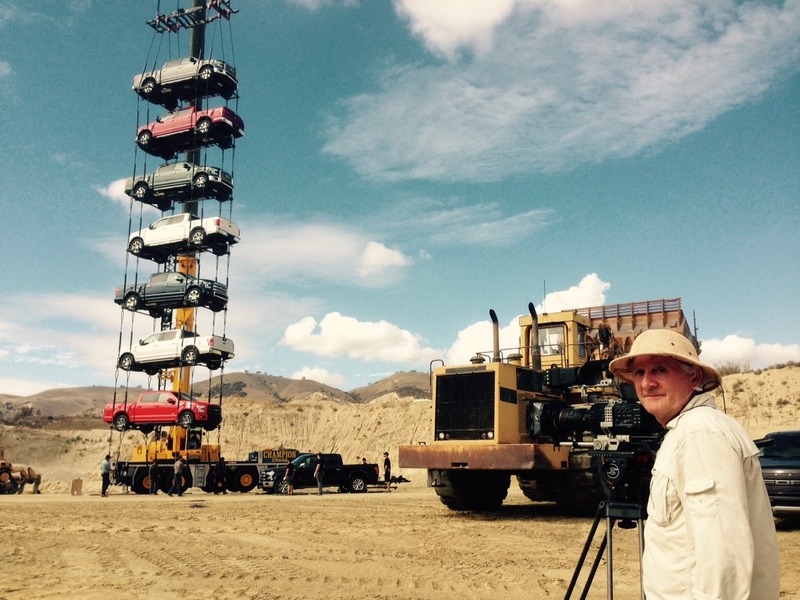 Shooting a recent web video edition of “Ford – Tough Science” was a pretty hair-raising spectacle. 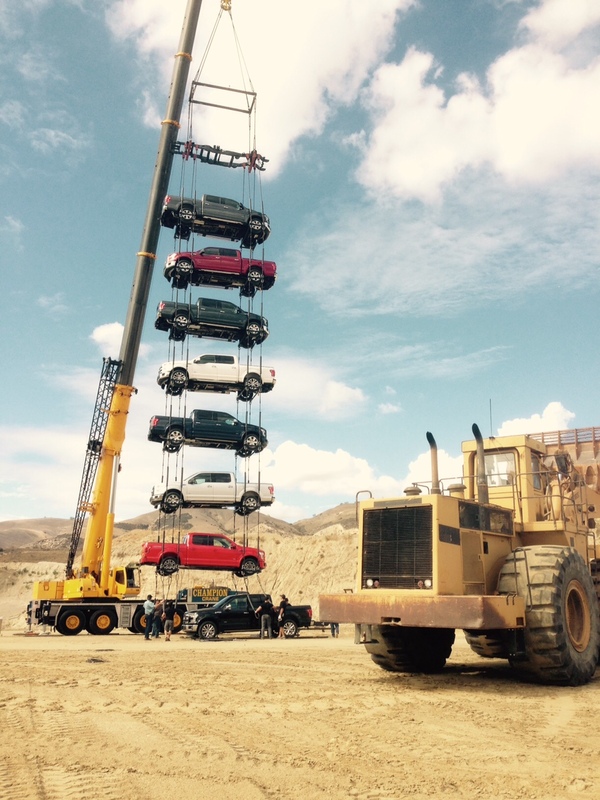 Those are seven full-size Ford pickups hanging from a 2017 F-150 chassis frame. Before we were finished, two more were added for a total of 60,000 lbs.